FP400 is an armored, fire resistant power cable for safety circuits associated with fire detection, fire alarm and emergency lighting. FP400 maintains circuit integrity during BS6387 CWZ fire test and produces very low levels of smoke and virtually no acidic gases. 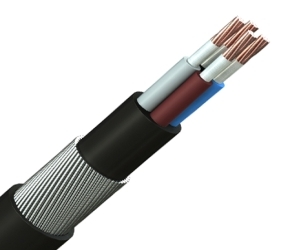 FP400 handles like a standard armored cable and can be installed just as easily. No special tools or accessories are needed to install or terminate FP400 and it is suitable for indoor or outdoor use and may be installed as direct burial, trough, fixed direct, tray or ladder.